Tell Me When It's Over is an interview series in which we ask former athletes about the moment they knew their playing days were over. Today: former basketball player Rick Robey. 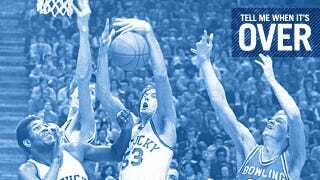 Robey was a fourth-year senior when Kentucky beat Duke 94-88 on March 27, 1978, to win its first national championship in 20 years. Teammate and Most Outstanding Player Jack Givens scored 41, but Robey made the all-tourney team by putting up 20 with 11 rebounds. Just over two months later he was the No. 3 pick in the NBA draft. He played almost 500 games as a pro and took home a world championship ring with the Celtics in 1981. Two years later, he was traded to the Phoenix Suns for Dennis Johnson. On April 1, 1986, he played his last NBA game. He shot 0 for 2 from the floor, pulled down four rebounds, and committed three personal fouls in 19 minutes of playing time. He's been a full-time realtor in Kentucky for over 20 years and two years ago he launched Robey Medical, a medical manufacturing business. He has read Drive: The Story of My Life, by former teammate Larry Bird, multiple times. Growing up I guess my big idol was always Dave Cowens. I always wanted to be the next Dave Cowens, and the crazy part about it is, all of a sudden I'm playing against him one day, and then teammates with him [chuckles]. On the playgrounds when I was young, he was the guy that I kind of always wanted to be like, once I figured out basketball was my direction. I mean, I enjoyed all sports. In fact, I was an all-state baseball player as a catcher, and I played football. I loved all sports, but basketball, just due to my size and stuff, was my avenue. There's not too many 6'10" catchers and not too many 6'10" defensive ends. One of the greatest memories was the final game in Rupp Arena my senior year. You know, your final time in front of 23,000-plus. It was a national TV game against Nevada-Las Vegas. Mike Phillips, James Lee, Jack Givens, myself—we had such a great four years together, and it was kind of our last hurrah in front of our fans. And the great thing about that: Everybody had a great game. As I recall, we blew out Nevada-Las Vegas, and it was just a great way to end your career in front of the home crowd. And then definitely, once we won the championship in '78 about a month later, it was a great relief, because we'd gotten close so many times and we finally got that burden off our back. Going into my senior season, I knew if I had a great year and our team had a great year, I was going to be one of those probably top 10 players. And then toward the end of the season, just by reading and talk, we kind of figured that I might be in that top 5. And then definitely after the championship game and we actually started talking to agents and different things, we felt pretty confident. My whole game was being able to run the floor, and once I was unable to run anymore—I had a real bad Achilles injury, I had a bad hip—once I lost that ability, the game was no longer really fun. So, you know, the Phoenix experience was a difficult three years for me mentally, just because I never was able physically to do what I wish I could've done for Phoenix. Because for them giving up Dennis Johnson for me, they were expecting quite a bit out of me, and it just never happened. I just didn't have the physical tools at that time to be able to get it done. It wasn't fun. I think my second year in Phoenix I played only three or four games due to all the injuries and the surgeries. And then, going into that last year, I knew I was there mainly because I had another year on my contract. Physically I just didn't have it anymore, and I knew the end was coming. It was one of those things. You're always going to try to get another contract. But, physically, I just knew it wasn't going to happen for me. My hip was probably my biggest thing. My Achilles really healed pretty well, but my hip ... And then I ended up having a total hip replacement at age 39. I was able to keep it calmed down with cortisone shots but those cortisone shots weren't going to—you know, it was enabling me to play my last few years, but it wasn't something that was going to ever really heal the problem. I knew down deep in my heart that I probably didn't have it anymore. I was hoping maybe I could've gone overseas and played where you're only playing two games a week or a game a week and not practicing as much, but realization just came in. I knew with a month to go in the season, our last game was going to be my last one. When I stepped out and we lost our game in the playoffs—or I don't even know if we were in the playoffs that year, I don't really remember—but I knew it was going to be my last one. After I quit, not being able to get the cortisone put into my hip, that kind of just ended it. I became pretty much a cripple. It's probably just the competitiveness of yourself. You're always hoping it's going to get better, but you really know it's probably not going to get better. I don't know. It's just that time when you know it's over. You've done it all your life, and now you're back in the real world. So what do you do next? And so it was kind of a "Here I go. What do I do now?" But life goes on. You learn from your mistakes. So then I go, "Well, you know, I love people. I love sales. Do I want to get into the insurance business or do I want to get into real estate?" And I selected real estate, just because I enjoy being around people and meeting people. And so that's the direction I went in. You know, it's hard for me to really remember [my last game]. I mean, all I remember back then was, I knew it was over and I knew I was moving back to Kentucky. I really don't know what that feeling was. I'd had so many good things happen to me in basketball that I guess I mentally had already prepared myself that life had to go on and to do something else. It's just I don't really remember that last game. And that's crazy to say, but I don't [laughs]. Good memories you remember. Bad memories you want to forget.